Iran Travel, Tourism Blog: Traveling to Tehran? Tehran with its unique scenic and structure in Iran have been a popular tourist spot for foreigners. 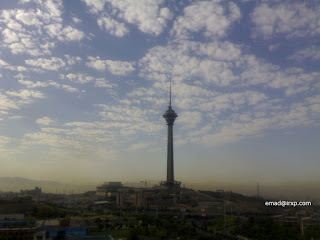 To be honest, as a person living in Tehran, I prefer to skip from the city for any period of time and relax outside!! but I've seen so many foreigners enjoying being in Tehran. Huge city, comparable with London or Mumbai and the different type of culture people have here may be among the attractions. Tehran Tourism is much interesting for historians, archaeologists but not for nature lovers, certainly! * National Jewels treasury: A throne, 200 years old, encrusted with precious stones all over the world, is the pivot of all attraction. A gem studded globe, world's largest pink diamond and other unique pieces comprises the unusual collection of this historical museum. * Golestan palace: The Rose Garden of the Qajar era is the oldest historical monument of Tehran. It belongs to a group of royal buildings that reflects the history of Iran. * Tehran bazaar: This shopping mall since its foundation consists of shops that sells strangest of antique pieces collected from all around the country. The economical set up on Tehran has much of its credit attributed to this 'bazaar' popularly called the city within a city. * National Museum of Tehran: The museum stands upright showcasing the rich heritage of Iran with a spectacular collection of ceramics, sculptures belonging to the 4rth and 5th century BC.